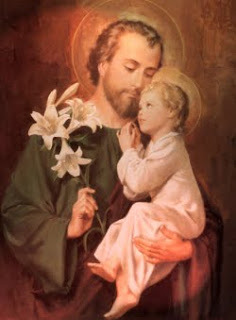 I am making this post for the amazing favor recieved from St Joseph last week after petitioning him saying the above 2 prayers for few weeks! I do hope everyone will be inspired to petition him even for things that you think are quite impossible at this point in your life! Once, on the Feast of the Annunciation, St. Gertrude had a vision during which the Heavenly Mother revealed to her the glory of her spouse, St. Joseph, in order to awaken in the Saint a greater love for him and to encourage her to have confidence in his intercession. "I saw Heaven opened and St. Joseph sitting upon a magnificent throne. I felt myself wonderfully affected when, each time his name was mentioned, all the Saints made a profound inclination toward him, showing by the serenity and sweetness of their looks that they rejoiced with him on account of his exalted dignity." 1) He is the foster father of the Eternal Judge, Who can refuse him no request. the Terror of demons and Conqueror of Hell. Appease the Divine anger so justly inflamed by our crimes; beg of Jesus mercy for your children. Amid the splendors of eternity, forget not the sorrows of those who suffer, those who pray, those who weep; stay the almighty arm which smites us, that by your prayers and those of your most holy Spouse the Heart of Jesus may be moved to pity and to pardon. Amen.